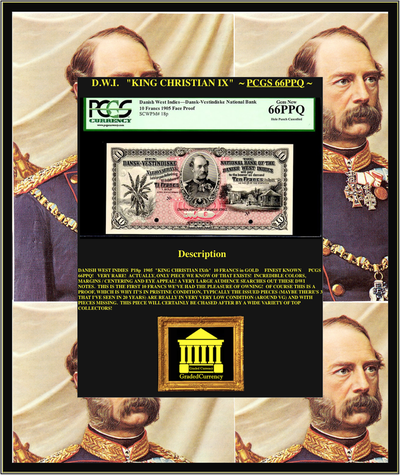 DANISH WEST INDIES P17s "KING CHRISTIAN IX" 1905 5 FRANCS - GOLD CERTIFICATE"SPECIMEN" GRADED PCGS 64! 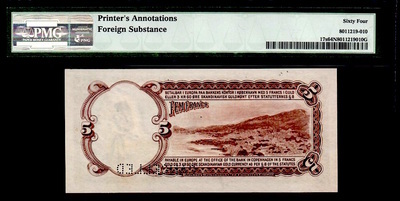 FINEST KNOWN BY ALL GRADING COMPANIES! ONLY 1 EVER GRADED BY CGC! THIS IS A VERY SOUGHT AFTER NOTE TYPE- GOLD CERTIFICATE ~ PAYABLE IN GOLD! 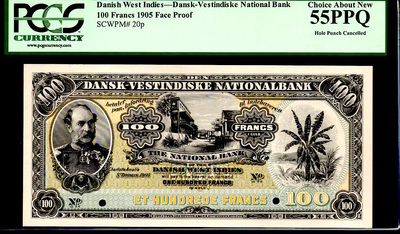 WE'VE ONLY HAD ONE OTHER DWI NOTE AND IT WAS ALSO A 5 FRANC, BUT IN VERY LOW GRADE. THIS PIECE IS AN ANOMALY IN THIS CONDITION - IN ALL LIKELY-HOOD IT'S A ONCE IN A LIFE TIME OPPORTUNITY! 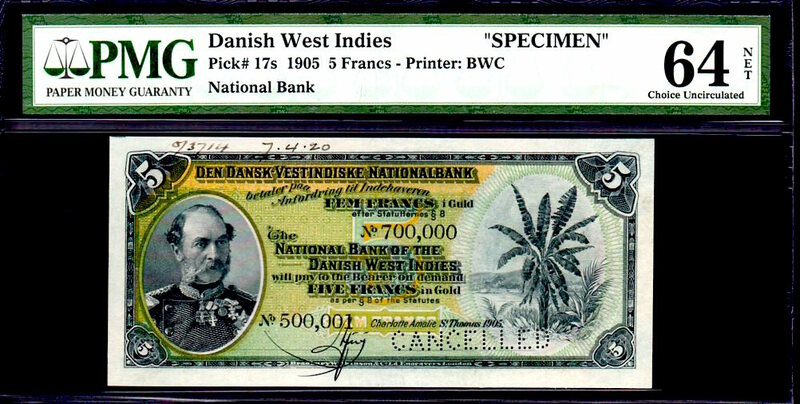 DANISH WEST INDIES P17 1905 5 FRANCS in GOLD ~ PCGS 35PPQ! WOW, LOOKS ALMOST UNC, ESPECIALLY FOR 110 YEARS OLD!!! 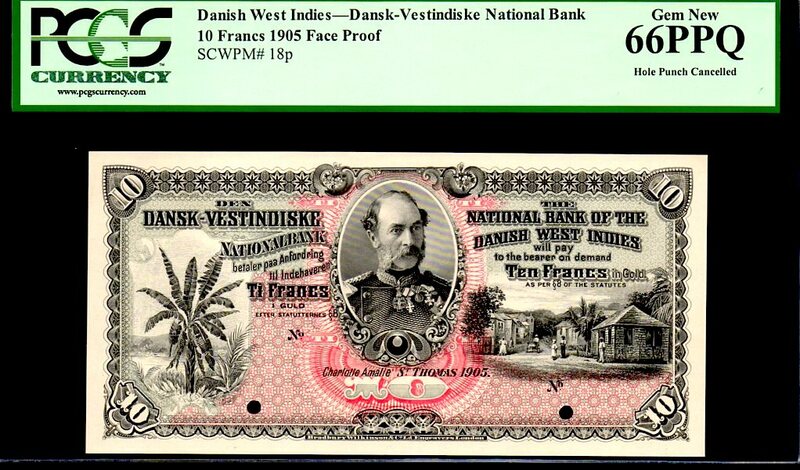 THIS VERY SOUGHT AFTER NOTE TYPE IS VERY RARELY SEEN. WE CARRIED THIS PIECE ALMOST 2 YEARS AGO IN OUR ORIGINAL ACQUISITION OF IT AND IT SOLD ALMOST INSTANTLY, NOW WE'VE PROCURED IT BACK (FOR OVERSEAS) AND ARE VERY EXCITED TO OFFER IT ONCE AGAIN. WE'VE NEVER BEEN ABLE TO FIND ANOTHER ONE, EVEN NEAR THIS CONDITION! 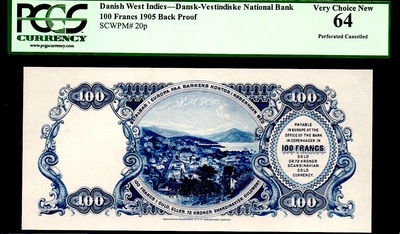 WE DO HAVE THE SAME NOTE TYPE AND THE 10 FRANCS AS WELL, IN SPECIMEN TYPE. THIS SPECIFIC PIECE HAS INCREDIBLE BOARDWALK MARGINS, BEAUTIFUL ORIGINAL PAPER AND COMPLETELY FREE FROM ANY DISTRACTIONS WHATSOEVER. 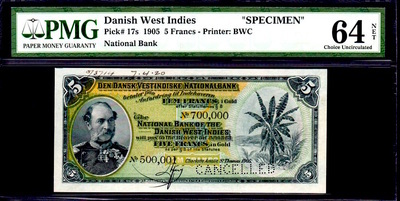 THIS IS TRULY A TROPHY NOTE, DESTINED FOR THE MOST DISCRIMINATE OF COLLECTORS! 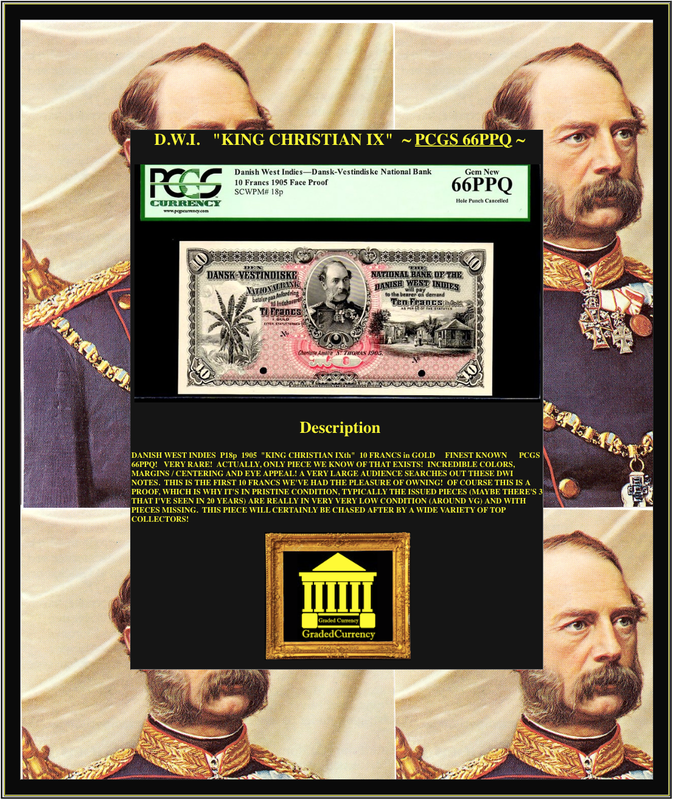 DANISH WEST INDIES P18p 1905 "KING CHRISTIAN IXth" 10 FRANCS in GOLD FINEST KNOWN PCGS 66PPQ! VERY RARE! ACTUALLY, ONLY PIECE WE KNOW OF THAT EXISTS! INCREDIBLE COLORS, MARGINS / CENTERING AND EYE APPEAL! A VERY LARGE AUDIENCE SEARCHES OUT THESE DWI NOTES. THIS IS THE FIRST 10 FRANCS WE'VE HAD THE PLEASURE OF OWNING! OF COURSE THIS IS A PROOF, WHICH IS WHY IT'S IN PRISTINE CONDITION, TYPICALLY THE ISSUED PIECES (MAYBE THERE'S 3 THAT I'VE SEEN IN 20 YEARS) ARE REALLY IN VERY VERY LOW CONDITION (AROUND VG) AND WITH PIECES MISSING. 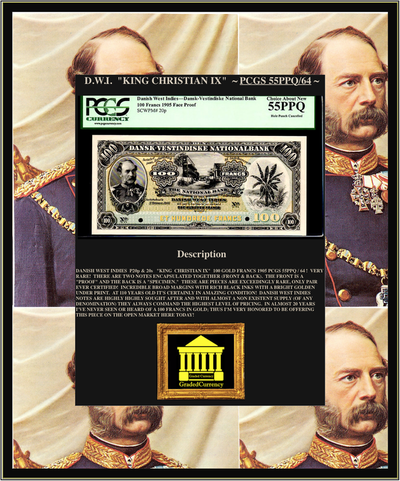 THIS PIECE WILL CERTAINLY BE CHASED AFTER BY A WIDE VARIETY OF TOP COLLECTORS! 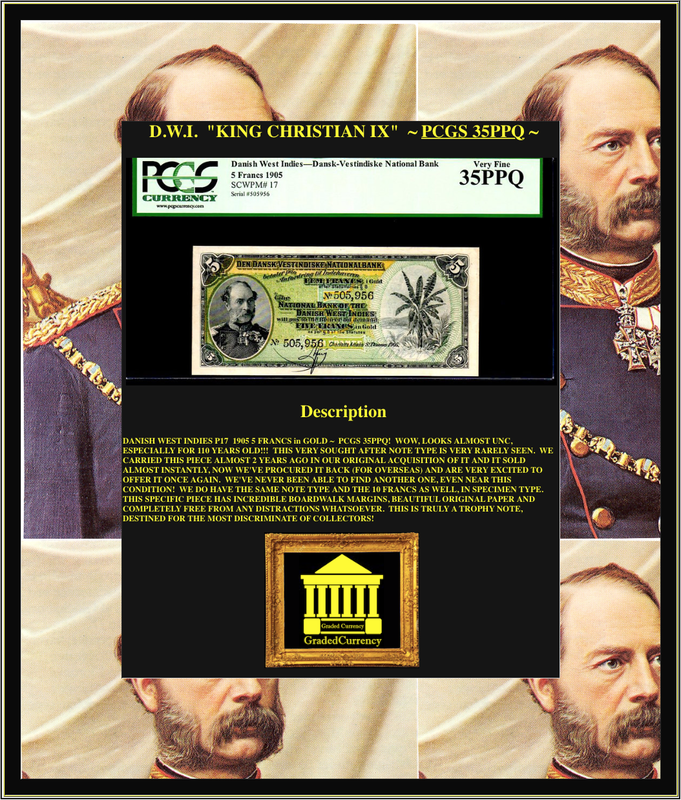 DANISH WEST INDIES P20p & 20s "KING CHRISTIAN IX" 100 GOLD FRANCS 1905 PCGS 55PPQ / 64 ! VERY RARE! 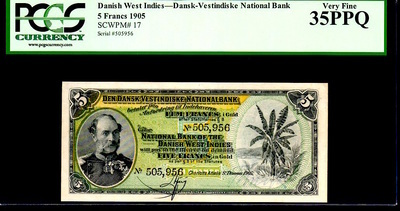 THERE ARE TWO NOTES ENCAPSULATED TOGETHER (FRONT & BACK). 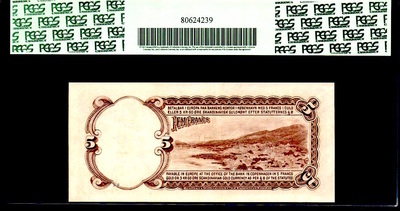 THE FRONT IS A "PROOF" AND THE BACK IS A "SPECIMEN." THESE ARE PIECES ARE EXCEEDINGLY RARE, ONLY PAIR EVER CERTIFIED! INCREDIBLE BROAD MARGINS WITH RICH BLACK INKS WITH A BRIGHT GOLDEN UNDER PRINT. AT 110 YEARS OLD IT'S CERTAINLY IN AMAZING CONDITION! 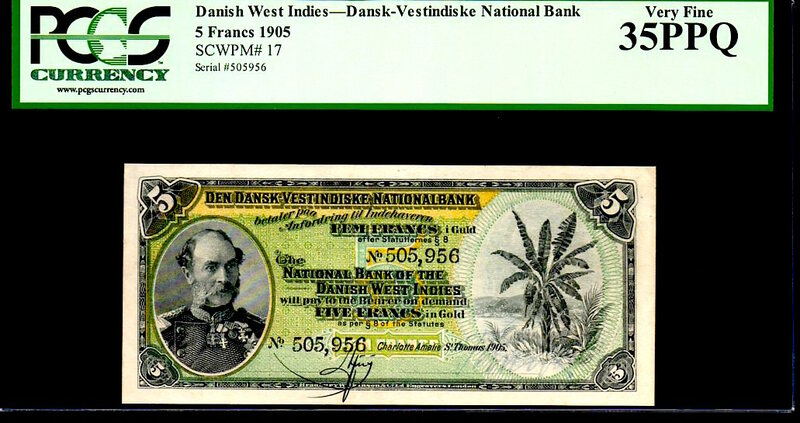 DANISH WEST INDIES NOTES ARE HIGHLY HIGHLY SOUGHT AFTER AND WITH ALMOST A NON EXISTENT SUPPLY (OF ANY DENOMINATION) THEY ALWAYS COMMAND THE HIGHEST LEVEL OF PRICING. 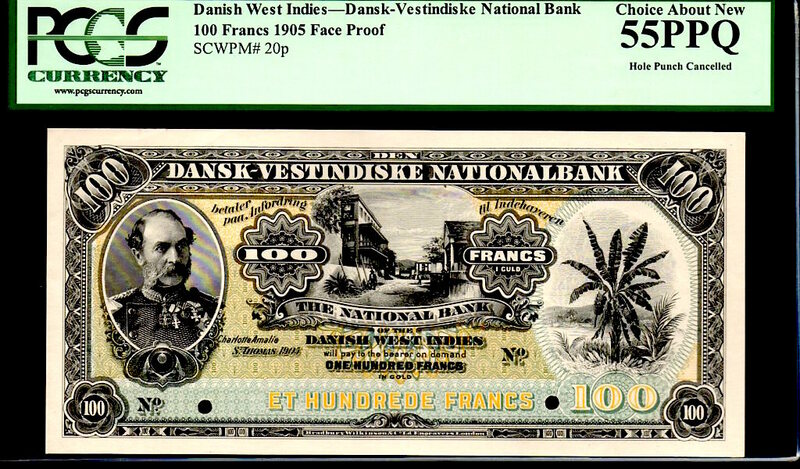 IN ALMOST 20 YEARS I'VE NEVER SEEN OR HEARD OF A 100 FRANCS IN GOLD; THUS I'M VERY HONORED TO BE OFFERING THIS PIECE ON THE OPEN MARKET HERE TODAY!